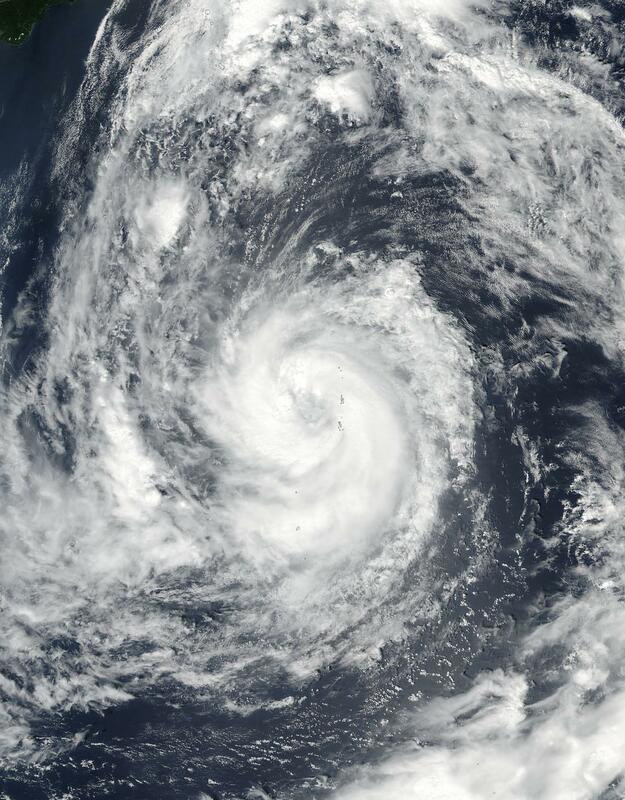 Typhoon Sanvu developed an eye that was about 28 nautical-miles wide when NASA-NOAA's Suomi NPP satellite passed overhead and captured an image. On Aug. 31, the Visible Infrared Imaging Radiometer Suite (VIIRS) instrument aboard Suomi NPP satellite captured a visible image of Typhoon Sanvu as it continued strengthening and moving north in the Northwestern Pacific Ocean, near the island of Chichi Jima, Japan. The island was formerly known as Peel Island and it has a population of about 2,000 people. On Aug. 31 at 11 a.m. EDT (1500 UTC) the Joint Typhoon Warning Center (JTWC) noted that Sanvu had maximum sustained winds near 86 mph (75 knots /140 kph). JTWC noted that Sanvu had steadily intensified since 5 a.m. EDT (0900 UTC) "under the influences of improving upper-level outflow, low vertical wind shear and favorably high ocean heat content." It was centered near 21.1 degrees north latitude and 142.0 degrees east longitude, about 51 miles north-northwest of Chichi Jima Island, Japan. Sanvu was moving to the north at 8 mph (7 knots/13 kph). Sanvu is forecast to continue moving north and strengthen to 103 mph (90 knots/166.7 kph) by Sept. 1 before starting a weakening trend.